When I came downstairs to eat breakfast before going to church, I saw that the wall clock had stopped. It’s a “grandmother” clock my father received as a gift for 20 years of service with the company he worked for. He wouldn’t make it to 30. That company downsized him nine months before he was to receive his full retirement package. Nine months. Still, it’s a nice clock, and it was given under a different company ownership, when people still cared, before the relentless string of mergers and ownership swaps. Because it’s a grandmother clock, it chimes every 15 minutes. And because it chimes every 15 minutes, it has three keyholes where you stick in a key and wind it. I wind it pretty religiously, but life is filled with distractions, especially this time of year, and I forgot that regular task. The hands read 1:59. Sometime in the a.m., it had stopped right before it was due to chime. Having had the clock all these years, I take the chiming for granted. I think any owner of such a clock does. After a while, you don’t notice the chiming as much. When it fails to chime, you don’t realize it. You have to note the lack of pendulum movement, and then you know. Something about a stopped clock makes me a little sad. That clock is wondrously alive so long as all its springs remain tightly wound, and the slow tick-tock fills the foyer. It’s a comforting sound, one that recalls a different, slower time. A time of artisans working deftly on such things as grandmother clocks, of great-grandfathers smoking a pipe while reading the newspaper, of sepia-toned memories and a sense that what is to come is a marvelous thing where people are somehow better than they are now. I wonder what Christian people in the age of grandmother—and grandfather—clocks thought the present age might be like. What can a clock tell us? My clock stopped a minute before it was due to chime twice. Slack springs couldn’t do the job of alerting us to the hour. People in the household forgot their duty, so the clock tick-tocked until it ran out of stored energy. It had been running on its last winding for too long and had no power left. Without that power, no alert sounded. It took a long time for anyone to notice the clock had stopped. The silence of a stopped clock doesn’t register immediately. One must know to listen for it. If no one listens, and no one considers what was once present is no longer, the clock persists in its mute deadness. A stopped clock is still right twice a day—so goes the old joke. Still, a stopped clock is far more wrong than right. It becomes less than helpful, because if you don’t see or hear it actively working, it gives mistaken information that can lead astray. What was once critical to one’s proper functioning is now detrimental. 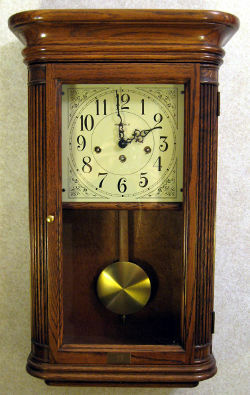 A stopped clock becomes an excuse for lateness and for failing to attend to important matters. A long time ago, a stopped clock was a major problem. How can it be reset unless another, working timepiece is present in the household? If the stopped clock was the sole teller of time locally, one had to go elsewhere to discover the correct time. In some communities, the church belltower might have a clock. Or the village square. Today, centralized timepieces are mostly lost to the past. Oddly, time signals fly continuously through the air now—but beyond perception without special gadgets to snag them. The proper time is always with us, but we can’t sense it without help. Those special clocks that intercept hidden signals require something more than just the simple human intervention of a winding. The average person might understand how a wound clock works, but the new kind are inscrutable to all but the most technically adept. Some would argue that the new technology behind clocks renders the old act of winding a clock moot. Everything has a clock in it nowadays. Funny, though, that so few can truly tell us the time. And you can add to that illustrious list the name of every born-again believer who has ever lived, including you and me. The great saints listed above at some point in their Christian ministry changed their view from more worldly to more godly. None of them (or us) sprang fully formed from the head of God. If we think otherwise, then we’ve confused God with Zeus and us with Athena. Greek myths, folks. Greek myths. Which is why I am utterly perplexed at the beat down so many young Christians receive from supposedly mature believers. We can claim all sorts of spiritual adventures and trips to the fourth heaven that even Paul didn’t get to, but if we can’t treat with kid gloves the young believer who has a mistaken notion about some spiritual thing, then we don’t know what discipleship is all about. And rather than looking like the Lord we claim to know so well because of our eight-hour a day quiet times, we bear more than a passing resemblance to a giant, round piece of bronze beaten with a large mallet held by a guy who should lay off the Twinkies. I don’t read as many Christian blogs as I used to because I got tired of the smackdowns. No one gets any theo-points from God for flaming some newbie Christian who mistakenly confused justification with sanctification. As far as the guy spewing the napalm goes, for all all he knows, he could be setting back the cause of Christ by beating down a young Christian who would otherwise go onto greater and greater ministry sooner and sooner had that newbie not incurred the wrath of a Protector of the Faith™. And it’s not just online. The way many new and not-yet-mature Christians are treated in our assemblies, it’s a miracle of God the gates of hell have NOT prevailed against the Church. Supposedly mature believers say all sorts of soul-crushing things to young Christians. And trust me, it sets people back. The kind of self-righteous, loveless rebuke some inexperienced believers receive is like a focused magnifying glass on a sunny day to an ant. Apollos was good—but he wasn’t quite good enough. He didn’t see the whole picture. He didn’t have the full empowering of the Spirit. He was too raw. But rather than verbally lashing Apollos for the inadequacies in his mostly decent theology, rather than crushing the life out of him because he had not “arrived,” Priscilla and Aquila took him aside and worked with him. Other brothers in Christ actively encouraged him and treated him as they themselves would wish to be treated. And the result was worth waiting for. Folks would not have been saying, “I am of Apollos” (1 Cor. 1:12), if Apollos had not finally come into his own as he grew in favor with God and walked that journey from good to great. Our transitions from sinners to saints is not a clean, clear-cut process. If you’ve been a Christian long enough, the one reality that comes out is that discipleship is messy. Your walk is a mess and so is mine. So what is the deal with beating down the newbies? Always lead with love. Always. Consider that Jesus uttered The Golden Rule for a reason. Start with encouraging a young Christian in what he or she is doing right. Keep praying that God would take that young Christian from one degree of glory to the next. When considering confronting a raw, young Christian, pray that God would do an inner confrontation in that youngster by His Holy Spirit first. Later, if the Spirit should reveal a need to partner with Him in offering gentle removal of specks, do so only after removing one’s own logs. NEVER correct unless willing to work alongside the young Christian to help him or her reach maturity. If unwilling to partner with that immature believer, then find others who will and leave the correction to them. Remember that if a young Christian is truly walking with the Lord, then God will not fail to complete His work, no matter how rough things appear at the moment. And remember: You and I started out rough, too. Did I mention to always lead with love? The world is full of beat downs of people who don’t quite have it right. We live in merciless times among smug people who think they know it all. But that can never be the Church of Jesus Christ. If anything, our love and mercy should always go out to the tenderest among us. Overheard countless times in the last two months: “I am concerned about the poor performance of my investments and savings. Not heard even one time in the last two decades: “I am concerned about my poor performance in laying up treasure in heaven. It all ties together, trust me. I recently turned 46. To me, that’s an “other side of the mountain” age. I look at people just 10 years older and they’ve gone gray and have that “retired” look. Entropy overshoots no one. When I take stock of my life, I’m deeply troubled. I’m simply not laying up treasure in heaven. Period. End of story. I wish I could say that the problem is found only inside me. But it’s not. In many ways, I know that I surpass a lot of other Christians in treasure-laying-up. At least here in the States. So my sister-in-law and I were talking about this issue and she unleashed the “Bloom where you’re planted” line. She said that God can’t fault us if we’re good employees providing for our families, raising up our kids in the knowledge of the Lord, and just being a good Christian when a good Christian is called for. Given the pressures most people face in life today, just doing those things has to count for something. The way I look at it, if you pull the average family man off the street and analyze his life, he’s probably doing most of those things. He may even be packing his family off to church once a week. But I can’t see how any of that fulfills the upward call of Christ. For all I know, that man doesn’t know Jesus at all. What then distinguishes the average American Christian from his non-Christian neighbor? If “bloom where you’re planted” is the be all and end all of modern living, then isn’t Joe Pagan blooming, too? How does that jive with the list of prerequisite works found within the “bloom where you’re planted” ideal? In the last 10 years, I’ve had one person try to witness to me. Her witness consisted of handing me and the rest of my group a tract. She did this for about 20 people, ran out of tracts, and then skedaddled, not saying a word. But then again, how can we expect anything else? Everyone is too busy blooming where they are planted to give a hoot about evangelism or spending time making disciples. The sad part, to me at least, is that I’m no better than anyone else. I’m too busy attempting to feed my family to have even two seconds for ministry. Back when I had a little bit more time, I encouraged my church to consider a mentoring program for kids in the church who lacked dads. Today, they put out the sign-up sheet. I stood there with a tear in my eye, unable to sign my name on the sheet endorsing the very idea I suggested. How can any of us expect to hear “Well done good and faithful servant” if the only people we serve are our families? Don’t the godless do the very same thing? The way we Christians in America live, I expect to see the vast majority of us standing at the end of the celestial line, our heavenly garb tinged with a hint of soot and sulfur after the test of fire incinerated everything we worked for in our earthly lives. Maybe a minuscule fleck of gold remained. Maybe. Emphasis on minuscule. And what is that speck? Our treasure in heaven. To bloom where we are planted requires we actually bloom. But not simply for ourselves. The fig tree that Jesus cursed probably did bloom. It just didn’t produce any fruit. Yet what point is a fruit tree with no fruit? What point is a Christian who has no time for obeying the command of Christ to go make disciples no matter the cost to us? What good is a Christian whose life revolves around the same daily routine as the non-Christian, save for squeezing in church on Sunday and some prayers and Bible reading during the week? Isn’t the barrenness just as obvious between the avowed follower and the lost? Many of us believe the end is close at hand. If so, what explains the lack of work for the Kingdom? We’re all so worried the economy will take our jobs away, but what if being forced to watch all our earthly treasure signed over to some bank is the best thing for each of us? Maybe actually losing everything would reinforce the words we speak glibly about forsaking all for Jesus. It’s a hard word, isn’t it?